OK. So, my husband looked at me like I'm off my rocker for a post about frying okra. Maybe he's right. Maybe you were all born knowing how to fry okra. I, however, was not. It took me a few tries to get it right. Now the plate of fried okra is empty way before we all want it to be. I know it seems like a summer food, but thanks to Publix, you can eat it all year round, and we do. This is the brand I buy. It's 2 lbs., frozen, and in a resealable bag--easy to use just what you need. 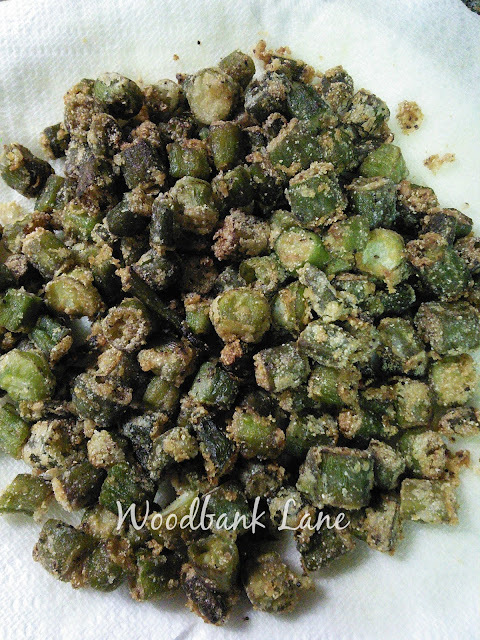 Pour the amount of thawed or fresh okra you want to cook onto a plate and gather your ingredients. After the okra thaws, salt and pepper it on the plate and put it in a gallon bag. Sprinkle the okra with the flour and add enough corn meal mix to sufficiently coat it. (Probably about 1/2 cup of corn meal mix to 1/2 lb of okra.) 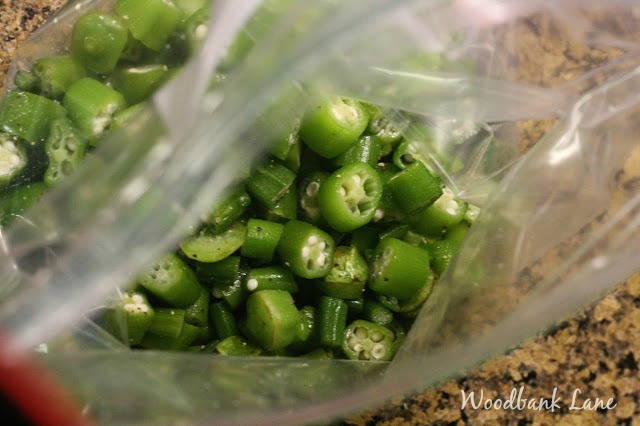 Seal the bag and shake it, flip and flop it, turn it upside down, whatever you have to do to coat the okra well. Add more corn meal if necessary. While you're shaking your bag, melt the Crisco over low heat. Most cooks would probably say you need an iron skillet, but I just use a regular Teflon one--the same one I use for everything. The Crisco should be about 3/4 inch deep, just enough to almost cover the top of the okra. It takes 20-30 minutes for the okra to brown cooking on medium-high heat. I usually cover it for the first 10 minutes or so, and cook it uncovered for the remaining time. Stir when the edges start to brown. Cook until it's the crunchie texture your family likes. Then, drain on paper towels and watch how fast it disappears.